Wandering past my local Sainsbury’s today, I was delighted to notice a poster in the window advertising various pieces of Halloween-related tat. Not that I’m particularly fond of Halloween, you understand; my happiness came from the hope that this new ad campaign might spell a merciful end for its predecessor. Well, it’s not up my street. It’s not even in my council ward, postal district or school catchment area. This isn’t creative cooking; it’s just babble – reminiscent of a concussed Manny in Black Books spouting jumbled-up entries from the Little Book of Calm. Not all of the suggested combinations are necessarily awful – Alison Lynch wrote in Metro that she’d tried out the coffee-in-Bolognese idea and found it surprisingly palatable – but that’s not really the point. The problem with the Sainsbury’s ads is that they represent the worst of all cooking worlds: miserable conformity, dressed up as innovation. 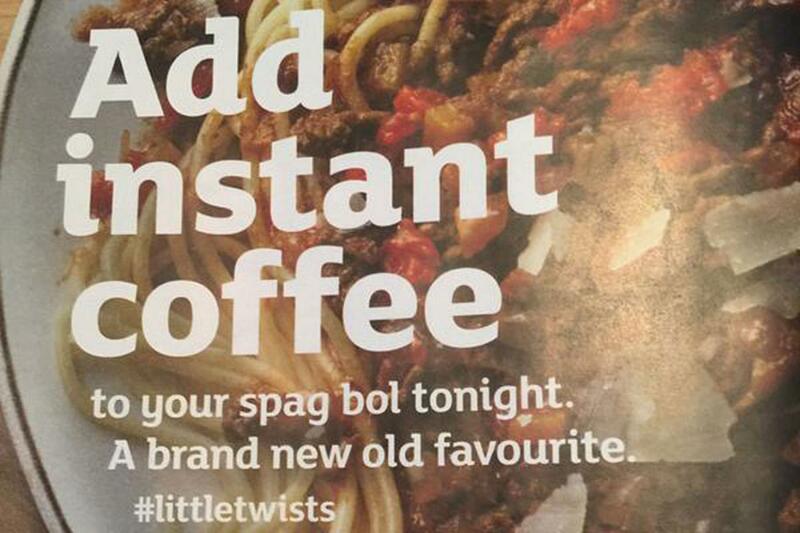 For all the [adopts best Christopher Morris voice] FURORE about this campaign – which, of course, is exactly what it was designed to generate – there’s nothing revolutionary about putting coffee in a Bolognese sauce. People – albeit not that many – have been cooking with coffee for years. It even gets a semi-honourable mention as a last minute stew addition in my own food bible, Hugh Fearnley-Whittingstall’s River Cottage Meat Book. It’s vaguely rich and vaguely savoury, and as such, makes a vaguely OK addition to most dark, meaty dishes – though a decent beef stock cube will do much the same job, but better. Ultimately, just as you’ll struggle to come up with an idea that nobody’s had before (cf. every proprietary argument about a Twitter joke ever), there’s barely a combination of ingredients that hasn’t been explored. Be it coffee, Irn Bru or blue WKD, if you can drink it – and in this, blue WKD finds itself on the borderline – you can probably get away with bunging it into a casserole. As long as its predominant characteristics correspond roughly with the effect you’re after – coffee for savour, Irn Bru for sweetness or blue WKD for, er, blueness – you won’t go far wrong. When it comes to adding the weird and not-so-wonderful to your food, the relevant question isn’t whether it’s right or wrong, or possible or impossible: it’s why you’d want to. Without a coherent answer to that question – an answer that might encompass flavour, colour, availability and necessity, among other factors – you’d be well advised not to bother, pending further investigation. If you’re in the food business, and the best selling point you can come up with is “well, you never know, it might not be awful”, you probably need to ask some serious questions of your product development and/or marketing teams. Yet, nearly 25 years on, this is effectively what Sainsbury’s are doing. Moreover, it seems to be working, in that their sales of spaghetti and instant coffee have apparently boomed since the campaign began. Which just goes to illustrate one thing: we really are a bunch of pliant, unthinking, head-nodding numpties. Why else would we go through the joyless exercise of making the same handful of largely boring meals again and again, to exactly the same prescription, then suddenly decide to stir utterly random things into them because some bright spark in an ad agency has planted the idea in our heads? I don’t believe in God, but if I did, this is exactly the sort of situation in which I’d implore him/her/it to help us. This isn’t just an advertising phenomenon; it occurs on an even more startling level via food programming, when an ingredient used by a TV chef one day becomes virtually unobtainable the next, as thousands of us rush to mimic what we’ve just watched, because it seems easier than thinking for ourselves. How wonderful it is to live in a society in which we can think and do largely as we please; and how depressing to discover that, given the opportunity, we generally elect not to bother. Is there a better way? Well, of course there is. And because I’m good to you, I’ve already taken the trouble to write about it. Just use the same skills you employ every time you pick a meal from a menu, or decide which components of your fry-up should form the next forkful. In other words, pick the flavour and texture combinations that seem right to you. Add something if it fits with what’s there already and the effect you’d like to achieve; and if it doesn’t, don’t. Develop your meal as you would a painting, pausing for thought before you add to it, and it will make sense in its final form, because every decision in its development will have been the product of your own critical analysis and taste. And if, by that process, you end up adding coffee to your Bolognese, Monster Munch to your burger or Kia Ora to your duck, then that’s absolutely fine. You might just happen upon something surprising and wonderful. At worst, you ought to end up with something unusual (if not entirely new) but still edible. More often, though, you’ll come up with a meal that may not be radical or outlandish, but is original nonetheless: your own creation, not one of Jamie’s, Nigella’s or Sainsbury’s(‘s). Instead of putting horseradish in your macaroni cheese, you might decide to add English mustard instead: similarly warming and spicy, but in both flavour and colour, a more appetising addition to the cheese sauce. And if you don’t feel like eating the same boring Bolognese, then make it with different meats, vegetables, herbs, cheeses, whatever. As long as you remember to think and taste as you go, it really will turn out fine.